SAFETY FIRST: The Park will be closed this Friday the 18th. There are reports of bad weather on the way. Open Sat. and Sun. At Moto Mountain Park, we’ve created a wide variety of riding trails suitable for every skill level on the ATV of your choice. 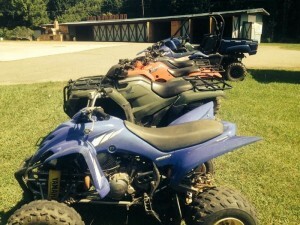 Our ATV riding trails have been rated as the “Best in Georgia”. We continue to add to the 79 miles of trails each week. Visit our Facebook page or sign up for our weekly newsletter for the latest information on new developments at Moto Mountain! We use Sunoco racing fuel. Helmet Required. Guests must bring their own gear. Stop by Motorcycle Pro Care to purchase gear or from our neighborhood repair shop GMD Computrack Atlanta. $35.00 + tax to ride. $20.00 + tax for passengers for side by sides. Gas, Food, and Souvenirs available from Moto Bob’s located at the entrance to the Park.